to catch the bus to Boston and fly to Amsterdam a day earlier than planned due to a last-minute booking on Aer Lingus (because our WOW tickets went belly-up with the airlines). a thoughtfulness we’ve received from them several times over, as Tika’s handmade cards attest. We’ll miss them and others, such as Maartje and Ingo with whom we’ve spent some time. Within 24 hours JUANONA acquired a live-aboard atmosphere always enhanced with fresh flowers. Spring is here and summer is coming! But, what really got us back into the cruising mode was an impromptu social hour(s) with some neighbors, owners of a brand new catamaran they designed and just launched. The three guys in the photo met in school while studying engineering and have kept in touch since then in spite of one living in the Philippines, another in France, and one here in Holland. And, what’s really wonderful is they are only one-fifth of a larger group who frequently gather for class reunions. I had stopped to talk with them earlier in the day due to noticing their new boat but not seeing a port of call or name on her. They pointed out they did have a name, “H”, written in band-aids on the stern. Seeing my quizzical look they explained the logistics…. With the Christening and name application occurring Saturday they needed a quick fix to comply with the Dutch requirement that all vessels sport a name. Since all are engineers I have no doubt they used waterproof band-aids. The next morning I met Deborah at Jesse’s cafe, Het Koffielokaal. As my friends know, these type of establishments become a mental and physical haven for me when boat living; and, I found Jesse’s just after he opened in the fall of 2018. And, how I got to know him was due to my totally spacing out and forgetting to pay the first time I was there. As you can read below he graciously accepted my apology. Since then it’s been my go-to place in Hoorn for writing enveloped in the comfort of peaceful and friendly coffee aromas. Het Koffielokaal is where Deborah and I rendezvous if not at her home or on JUANONA, and this morning we stayed for several hours talking about our winters. She’s the co-author of a book informing how to get a better night’s sleep (September 2018). She’s on the fourth reprint, so it’s slowly but surely picking up momentum. I just wish it was in English. Sunday we left for those boat errands, one being to drop off the life raft for its three-year inspection in Rotterdam and another leaving Scandinavian guides for some cruisers in Blankenberge, Belgium. In between we managed to explore two other places in Belgium, both of which I’ll cover in later blogs (oh, lucky you.. but, you may want to scan one of them because our B&B owner in Antwerp is a superb host). After a too-brief catch-up Thursday night with our friends Richard and Linda from England (pictured 2nd and 3rd from the left in the August 2018 photo on the Danish Island of Møns), we prepped JUANONA for her 2019 inaugural sail to our haul-out port 11 miles south the next morning. and poignant because our time with our Dutch family was counted in hours, not days or months or years. If Thijs hadn’t stopped by our boat May 2016 when we were tied to the wall in the old harbor we never would have thought of wintering in their small, volunteer club. So, you can understand how wonderfully apt it was to have them aboard for our last sail out of Hoorn. Within two hours we had arrived at Monnickendam, an old Dutch town we had visited a few years ago with our friend Anne (March 2017). With their bus to catch and our organizing for haul-out, we had to say good-bye to our friends, something I never enjoy. Like removing a bandaid, it’s best to just rip it off and then not think about it until later. They’ve been our home port and close friends since 2016. We’ve sung ‘Do re mi’ cycling through Hindeloopen, shared many a meal both on land and water, seen Tika grow into a teenager, and traveled in conversations through many topics. The hugs were powerful reminders of what we were leaving behind, but also what we’ll have when we meet again. and later power washing the hull. It’s been three years since we’ve had her out of the water and we were pleasantly surprised to see relatively little marine life adhered to her. The two winters in Ipswich’s brackish water and the three in Hoorn’s fresh water kept barnacles to a minimum. In 2015 and 2016 we managed to remove the one-year growth with an hour of gentle sponging by hand. However, this time a forceful spray managed to remove all the algae within ten minutes. A nice reprieve for our four arms. Now, with just a few more days and nights ‘on the hard’ * we’ll be back in the water and primed for summer! 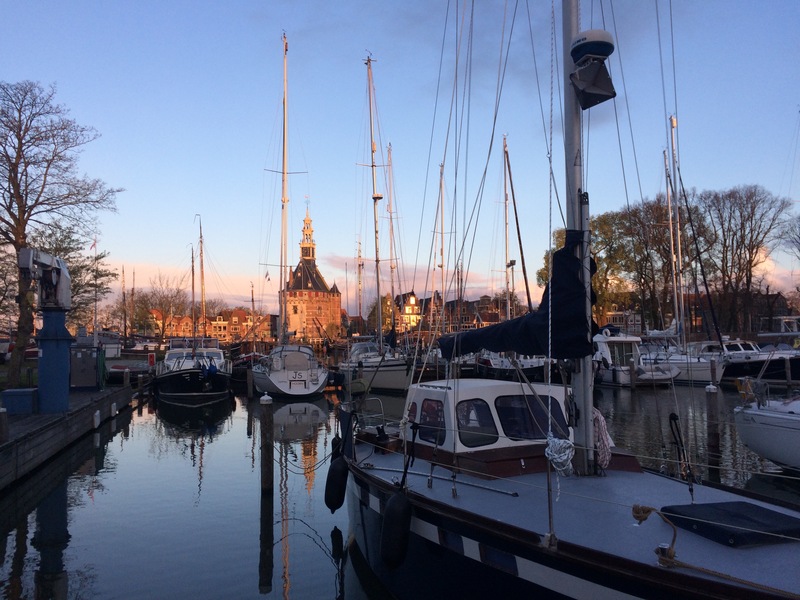 This entry was posted in 2019 04 NETHERLANDS - Hoorn, Monnickendam, COUNTRY, Europe, Netherlands, SUMMER CRUISING on April 22, 2019 by margaretlynnie.